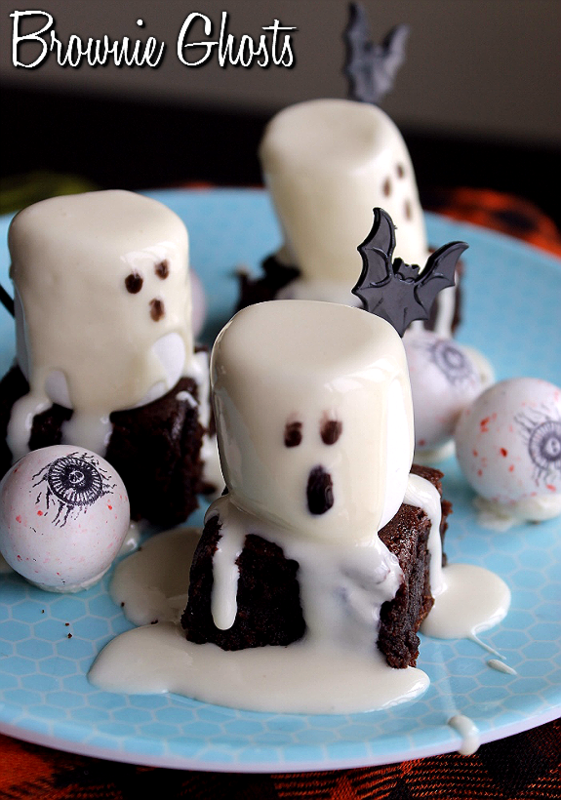 Momma Told Me: Brownie Ghosts- So Simple, It's Scary! 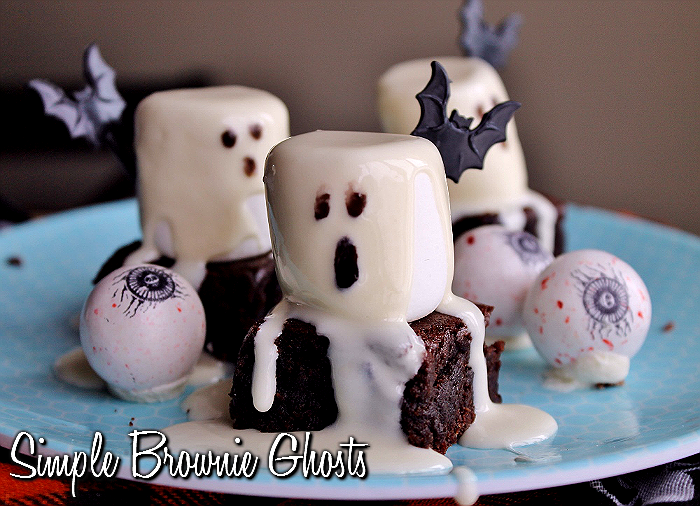 Brownie Ghosts- So Simple, It's Scary! Momma Told Me: It's almost scary how easy it is. If Momma taught me one thing in the kitchen it's that, as good as it is to go all out and impress people with your mad skills in the kitchen, it's even better to enjoy the praise knowing you've created something amazing with hardly any effort at all. Some people call them 'hacks' or shortcuts, but there's no shame in grabbing a boxed mix from the baking aisle when your 4th grader announces she needs treats for a class of 25, by tomorrow morning. You still want to be the cool mom, right- but you don't want to be the mom who's cool because she's perfected her 'living zombie' walk after slaving in the kitchen until 4 am. This idea is so simple, my friends, that I adapted it to an (almost) sugar free version for the sugar intolerant folks in my Thursday night bowling league. Am I Betty Crocker? No! I caught some Pillsbury Sugar Free Brownie Mix and Sugar Free Frosting on sale at my local grocery store. Viola- the only sugar ingredient was my Jumbo marshmallows! Are you ready for the super simple directions to these adorably wicked treats? Simple Directions: Start with brownies- I do not care how you get brownies, I won't tell if you slaved over them for hours or not. Cut them into squares about 2" in width. Place 1 Jumbo Marshmallow atop each brownie square. Place the pre-made frosting of your choice into a microwave safe bowl and heat on high at 5 second increments until it can be stirred into an even liquid format. Spoon melted frosting over your mallows, allowing it to drip down the side like flowy ghost 'sheets.' Squirt some black food color or decorating gel on a plate and daub the end of a chopstick/skewer/cake pop rod (etc) into the black and daub tiny faces on your ghosts. Refrigerate until serving and enjoy! It's really as simple as that- you can't go wrong. In fact, the messier the better, so go ahead an let your children pour the frosting and daub those faces. Some of my faces 'ran' from the warmth of the frosting and added even more character. These were a huge hit at my league, and just $5 served about 40 people a brownie bite each. If you want to get REAL fancy, use some seasonal toothpicks to decorate and make picking up the bites a little simpler for your guests. What Daughter Says: If it tastes great and looks adorable, nobody will care how long it didn't take you to make them! Those are so flipping cute!! They came out awesome. 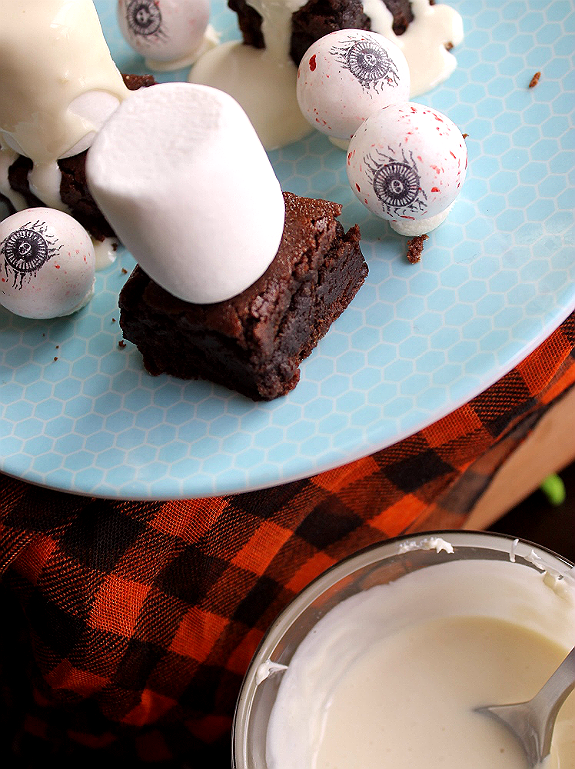 Brownies and marshmallows? Yummers! You definitely got my attention. Those are the cutest little goblins ever! Very creative! Wish I were there to sample one (or two) for you! I love those! My kids are always asking to make things, these they can pretty much do on their own. Thank you! These would be so cute to serve at one of our Halloween get togethers. I love how easy it is to make these. Omigosh. I love these, they are super cute! I bet they taste delish. Those look both adorable and delicious! I love it! How cute is that?! I love it both for how I'm sure it tastes and how easy it is to make. I LOVE what your daughter said! She's one smart cookie. These are super cute and look like they are pretty easy to make, so the kids could help me. These are so cute and look so yummy. I'd be more scared not to eat them then of them. These are just darling and so easy to make. I know some kids who would flip for this Halloween treat! These ghosts are absolutely adorable! I know my daughters would adore these treats! Those are so adorable! I love the drizzle over the entire thing. It almost reminds me of when the Ghostbusters would catch ghost in their little contraption. Yum! These look delicious and super easy to make. My kids would love these. Those are just the cutest little treats! Kids would get such a kick out of them! Those are too cute. I want to try making these! These look fantastic. It would be a great treat to make with the kids. I will have to try them for sure. 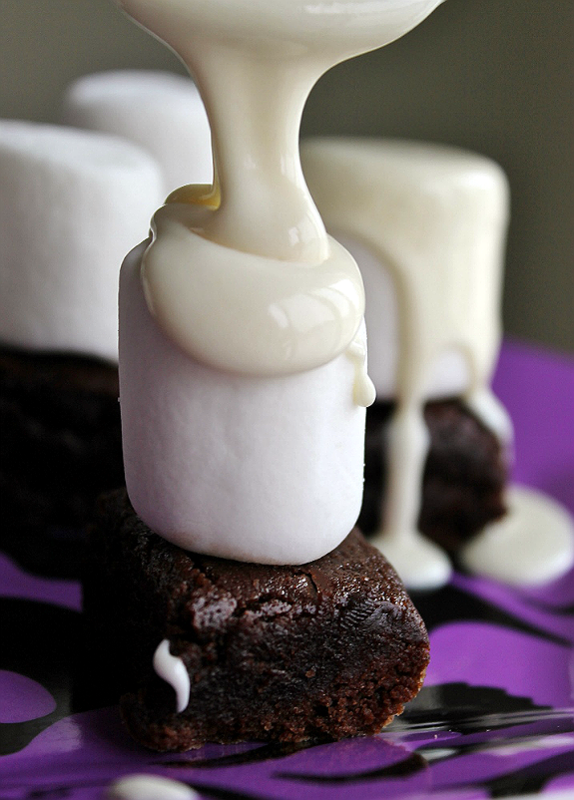 What a clever idea, marshmallows melted over anything would be good! Those look SO cute and chocolate and marshmallow is a yummy combination. Those are so cute. I am in the middle of packing so I keep bookmarking the things I want to make next year. oh my goodness these are adorable! What a clever idea. These are by far, the most creative looking Halloween Treats I have come across. Super cute! 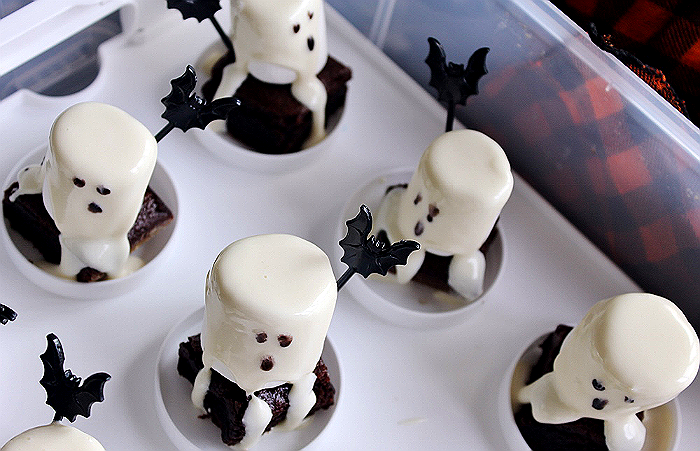 These brownie ghosts are adorable! I love how easy they seem to be to make! Thanks for sharing this great recipe! Those looks absolutely AMAZING!!! So cute! You are one creative gal! How fun! They're so cute and so easy. That's the best kind of treat! Awww, how sinking adorable. What a creative treat. Those are so cute. My kids would love these. They could actually help make them! Those are completely adorable! Easy enough to make too, I need to on Friday!